I thought of Aspen's certainty that I couldn't be a princess. I remembered the last-place spot in the public poll. You know what's strange? That I like these books. Yeah, you heard right. 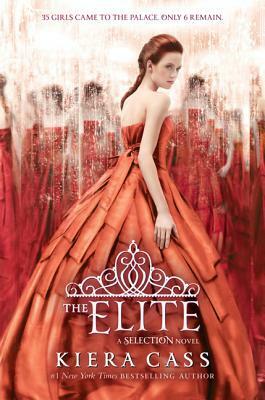 I, Bloody, who disliked Divergent and Matched and all that other hyped stuff, liked The Elite. A book which basically consists of nothing (with cheese). And the part that disturbs me the most is that I don't even know why. Because, let's face it, the Selection series is garbage. It's a big mess, with no real plot aside of the Selection itself (and America wondering if she loves Aspen or Maxon), most of the characters are horribly written and / or I just disliked them with a burning passion and unless The One ends with a giant massacre where everybody dies (though that would be kinda fitting) you cannot talk of decent foreshadowing either, everything is pretty clear. Sure, there still is the caste system and we finally meet some rebels, oh, and Maxon, but that's about it. Everything else? America was annoying, Aspen should go die, so should Celeste, and Kriss, and the king... I did like Marlee and Maxon and Silvia and Amberly, oh, and the cousins of the Italian princess, they were epic, but that's about it. And Natalie should at least pretend she has a brain. Oh, and Team Maxon by the way. Though Maxon did some pretty bad things and I won't ever forgive him for that thing with Celeste, his defense towards America was no excuse, he's still a million times better than overly-perfect Aspen, a character made to lurve and yet is so loathsome. If you search for a stupid, cheesy, dystopian-y lovestory (that's what the series is, honestly) and are not easily annoyed by nothing happening, this is for you. Actually, it wouldn't be something for me either. I need action, I can't take cheesy stuff (Oh, the pain while reading Passion. The paiiiiin. ), and if nothing happens, I'm not interested. Maybe it's the covers that draw me in so much. No idea. *shrug* Really, I can't even tell you why I like it. It's just how it is. Could I be the next princess of Illéa?